Your visit to Maui should include enjoyment of the local culture. One of the predominant arts of Hawaii is its music. There are several styles of music in Hawaii, including traditional slack key and ukulele styles. Recently, reggae music has become popular among local musical artists. 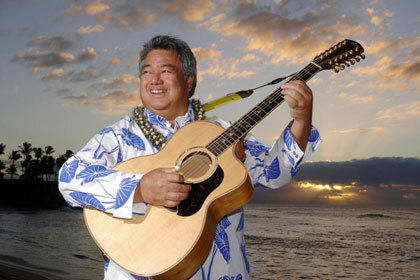 One well-known Maui musician is George Kahumoku Jr. Famous for his mastery of the 12-string guitar, he was recently nominated for a Grammy in the "regional roots" category. George performs weekly at the the Napili Kai Beach Resort. For those of you staying in Kaanapali Beach, there are several options here to take in the sounds of native musicians. Also, Lahaina offers several traditional music venues. We know we don't need to remind you of the convenience of a rental car for getting from lodging to concert or across the island to one of the beautiful resorts that offers nightly music. Evening drives are beautiful, especially as you head home humming new melodies. The best way to know what's playing and who's performing is to check the local papers or ask your concierge for musical recommendations. We know your visit to Maui will be enhanced by taking in the local culture. The music of Hawaii has a long and colorful history steeped in folk traditions.